Blender, Boxcutters, Jigger, Muddler, Shaker Classic/Boston, Skewers, Citrus Juicer, Strainer, Stirrer (long Spoon), Rocks Glass. 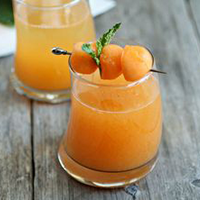 To make the puree, peel and chunk about half a cantaloupe melon and blend it in a food processor until smooth. Half a melon should yield about 6-8 oz. or enough for 3-4 drinks. Add the vodka, of the melon puree, the lemon juice, simple syrup, elderflower liqueur, melon liqueur and mint to a cocktail shaker. Muddle the mint with a muddler or the back of wooden spoon. Fill with ice and shake well. Pour through the strainer into a chilled Martini Glass and garnish with a few melon balls, if desired.